Depressing the one button on the front of the CPD, I allowed a few seconds to pass before I could be sure I was completely invisible. I had hoped the sheath that cloaked my appearance was a little more physical, but instead the rain continued to pour onto my head with being intercepted. I didn't feel like anything had changed, but the others seemed to think otherwise. They could obviously tell where I was, but the device was hiding my form, just not my shape. "The CPD doesn't work well in weather such as this, it seems. We can just about make out your outline but only when it rains heavily. If you stick to moving quickly and getting into cover whenever you can, they may not notice you." "How is he going to get past those guards though? Even if he runs the entire way to make it less obvious where he is, the soft sand is still going to show his footprints when he walks over it." "All I can suggest then is that you head around to the far Northern side and hope it isn't as heavily guarded on that side. Make your way to the wall, and the overhang will at least prevent your silhouette from being visible. As long as you don't walk when someone is looking in your direction, you should remain concealed." The problem with being invisible is also the main purpose: no-one can see you. That means no-one reacts to your presence accordingly, as they would if I were just standing there. Instead I'm having to do twice the work as I'm having to determine where I am, where they are and where they're looking, and whether I'm likely to get in the way. They won't step around me if I am, and they're unlikely to shake it off as nothing. The other thing was that there were meant to be fourteen Elite soldiers wandering the area, so that was going to be even worse. I wouldn't be able to see them, nor would they be able to see me. However, looking down towards the base of the tower, I could see a few shimmering spots which I took to be Elite soldiers. Their armour would automatically be visible anywhere even in normal weather, according to Jeff, so at least the rain helped me in this way. "Good luck Syeonyx! We'll be waiting here in case they spot you, in which case we'll create a diversion." "Syeonyx, we will aid you in any way you require us. We still have not been seen by the evil ones, and so can remain an actual deterrent for longer. If you wish for us to intervene, we will be on hand to help you. Do not worry; there are over twenty of us scattered about the area, lying in wait." I began to head West again through the tree line, skirting the sandy area the base of the tower was sat upon. I needed to reach the far Northern side and then head across to the base where the amount of sand to cross was the smallest. That way I would remain concealed for longer. As I passed the Western side, I could see that the door to the tower was actually open! There were a few guards outside, manning the entrance, with at least three or four inside the base. I would have to get inside and then deal with whatever I came across in the correct way. As for any Elite soldiers, I could only make out the shimmers I had seen earlier, and no new ones. They were going to be harder to spot inside, especially if they weren't moving. I managed to reach the base of the tower with surprising ease; dashing from the tree coverage to beneath the ledge was the most intense part, but no-one saw me, and the sand directly beneath the ledge around the edge was a little drier. That would at least ensure that I would get further towards the tower entrance without leaving incriminating footprints. Edging around the corner, I had to time my dash just right. Not only could none of the guards be in my way, but they couldn't even be looking in my direction. They would likely see where I'm standing and catch me. I had to time it just right. Luckily there were only three at the front, and with the entrance itself actually open, getting inside was easier than I thought. I winced every time I placed a foot forward; the sand beneath my feet crunching with what seemed like deafening sound. At one or tow points I had to remain still as they looked in my direction; the rain was unable to get to me, but I could feel my feet sink slightly as I stood on the spot, the sand not able to fully bear my weight. "Why have we been called to this place anyway? It's tipping it down, the weather's going nuts and there's nothing else going on. What's with the tower anyway? Does it broadcast radio signals or something?" "Probably, I don't know... All I know is that we're to remain on guard and to take down anyone attempting to gain entry. Presumably they have stuff in there worth sabotaging." "There are a lot of civilians running around in there. What do you think they're doing here?" "Look, we're not being paid to ask questions, we're paid to stand and keep watch. Kill on sight and ask questions later, if we get the time, and even then not the questions about the tower." Slipping inside, I had to ensure I didn't move too fast; I was soaked to the skin, and would leave a small trail of water wherever I went. Standing still would be my only defence mechanism until I dried out a bit. Heading into the main base, I was able to see a few scientists milling around. Oddly this time the base of the tower was crawling with life; scientists, guards, and judging from the shimmering spots in the corner, at least two or three Elite soldiers. It was then that my attention was drawn to the central column. 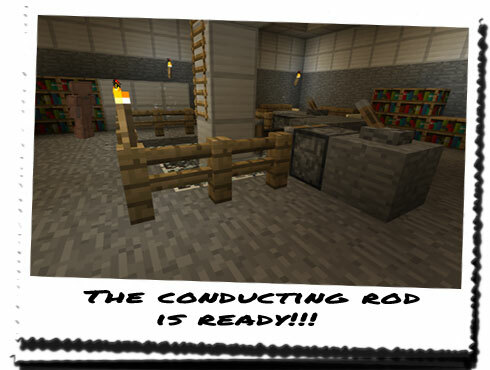 Up from the main antennae running down to the base of the tower and through to the portal was the conducting rod. At the base there was a mechanism that was used to slid the final piece into place. This would presumably stop the tower from attempting to power up the portal if there were thunderstorms. In any case, the mechanism had been activated, and the single piece was in place. No-one seemed to notice me enter, and standing to one side to dry myself out of the way, I was able to determine that there were three Elite soldiers in the tower. The shimmering air around them was almost imperceptible had it not been for them moving. It was like a rippling body of water, or looking through the air above a heat source. One stood still for a few moments, and I almost lost them until they moved again. Their technology was good, but ours was more efficient and had gotten me this far undetected. Once I felt I was dry enough, I continued towards the stairs. Careful not to bump into anyone, I walked slowly and cautiously, constantly looking around for anyone that might be coming my way. If they were I would have to move out of the way quickly! Luckily I managed to make it halfway down the stairs before I met someone. It was a scientist going up to the base, and he seemed far too interested in a collection of papers he was carrying to notice me huddled against the corner, trying to flatten myself against the wall. At one point I thought he brushed me; he stopped and looked up to the top of the stairs, before quickly looking around below him, and then his gaze swept over where I was. Nothing. He continued walking and I managed to make it down to the bottom without seeing anyone else. When I reached the chamber, I was moving quickly, knowing I had little time left; I had to rush forward to the master portal and place the Keystone within the frame. From there I would have to exit quickly; I could only hope the distraction it would cause would be enough to allow me to escape. All around me people were dashing back and forth, talking quickly in excited voices. There were at least twenty scientists and a few less guards. With all of the activity I couldn't make out any shimmering air, so I was unsure how many Elite soldiers were here too, if any at all. It was then that my attention was drawn to the walls. On every one apart from the entrance wall and the master portal wall were numerous primary portals. These were activated by activating normal and secondary portals. Once enough were linked, a primary portal would activate, adding energy to the final activation of the master portal. Once all of them were active, a single jolt of electrical energy harnessed from the sky would be enough to open the master portal, and allow the evils to flood out. I was already familiar with this, but I was paralysed with fear; they had all but one primary portal active! I had no time left! As I began to tune in what they were actually talking about, I realised I was too late. They had activated enough portals to power on the single, remaining primary portal! "How long until the energy transfer is complete?" "We don't know. It could be a few seconds, it could be an hour, it could be a day!" Not if I could help it! I began to dash down to the stairs, when I stopped. There was the sound of some odd machinery powering up, like it was collecting energy or something. Looking up, I could see the remaining primary portal begin to spark with the strange purple particles, flickering slightly, before appearing as fully active! The master portal... It was ready! 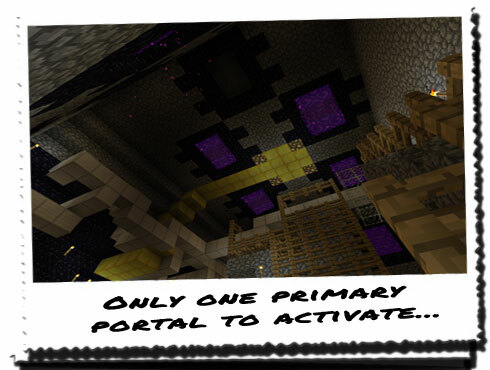 Once all of the primary portals were activated, nothing could stop the master portal! I've got to break free!